For real bipartisanship in Congress, we must celebrate the passing this week of a resolution in both the House and Senate to honor Filipino World War II veterans with the Congressional Gold Medal. Low-hanging fruit? Slam dunk? Not necessarily. It required 70 senators to co-sponsor a resolution led by Hawaii Senator Mazie Hirono. And then it needed more than 290 members of the House so it could pass by unanimous consent, Ben De Guzman of the Filipino Veterans Recognition and Education Project told me on Emil Amok’s Takeout. The real work was getting the legislators to understand why the Filipino World War II vets deserved a Congressional Gold Medal in the first place. More on that toward the end of this column. News of the Congressional medal for the Filipino Vets coincidentally comes after Donald Trump stumbled while trying to be bipartisan on the more contentious Deferred Action for Childhood Arrivals (DACA) program. After a meal of Chinese food with Trump, Democratic leaders Charles Schumer and Nancy Pelosi were so quick to announce they were aligned with Trump on the Dreamers. Maybe even before the eal was digested. They released a statement that said a framework for a deal on DACA had been reached. “We agreed to enshrine the protections of DACA into law quickly, and to work out a package of border security, excluding the wall, that’s acceptable to both sides,” the statement added. The idea was that border security would somehow be combined with the DREAM Act, which the Democrats a week ago had called for an immediate vote. But if a meal and a deal were done, Trump apparently had a case of acid reflux. 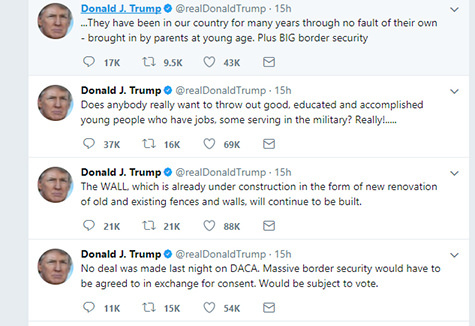 He followed that up with more tweets that a wall definitely would be built. But then Trump tweeted out two other messages that sounded like a real pathway to something was being discussed. Could have been regurgitated from a Democratic press secretary’s talking points. Later, Trump told the media he was behind some kind of plan. The lesson: Bipartisanship will not be easy, though it appears Trump doesn’t mind being called “Amnesty Don” by Breitbarters. He threw them some red meat after all the DACA hubbub when he repeated his remark about violence “on both sides” at Charlottesville. He’s showing he’s tired of losing the straight Republican way on just about everything. So as Trump tweets and defines and redefines himself on any number of issues, we’re all stuck with his shifting politics, bending left or right, depending on the issue. It’s a kind of situational politics that is really not much different from any successful politician in the recent past, from Obama, to Bush, to Clinton (Bill or Hillary). Is it principled enough? Is it too compromised? When ideology gives way to practicality, it may just be the cost of getting something done. Let’s not forget even Obama had his compromises. He not only gave us DACA, but deported millions of people during his tenure. And then there was Guantanamo. Just way more perfect than Trump. Contentiousness has a way of screwing up attempts at bipartisanship. On DACA, it was interesting to see the Republicans immediately fight amongst themselves. The nationalists see DACA recipients taking away jobs and admissions spots in college, and want them all deported pronto. The more compassionate conservatives see the DACA recipients as smart and upwardly mobile. They won’t mind a pathway to citizenship as long as it provides the 800,000 a pathway to the GOP. And Trump? All he cares is that you see him as the guy who fixed another “mess” left by his arch-enemy, Obama. It will take some doing to get to a bipartisan promised land on contentious issues like this one. For now, issues like The Filipino Veterans Congressional Gold Medal resolution, passed by both the Senate and the House, serves as a reminder that the two major parties can work together. It’s so rare in these uncivil times–you have to marvel that it can still happen. De Guzman told me on Emil Amok’s Takeout that the toughest part was educating the legislators. Many just didn’t know the role of Filipinos and the Philippines in the Pacific during WWII. For example, most knew that General MacArthur retreated and returned. But they didn’t realize how vital the Filipinos in the U.S armed forces there were during the void. The Congressional Gold Medal is expansive in scope and will be awarded to all Filipinos who served in WWII. In other words, not just those Filipinos who answered Roosevelt’s call in the Philippines, but also Filipino Americans who were in the U.S.
De Guzman said the number eligible for replica medals could be as high as 250,000. The actual gold medal will be awarded on Oct. 25 in a special ceremony at Emancipation Hall in the U.S. Capitol Visitor Center in D.C. It will then be on display at the Smithsonian. A community celebration is also planned after the ceremony, and the first 1,000 who registered at https://www.filvetrep.org will get replica medals. Go to the website to see if your loved one’s service makes him or her eligible for a replica. De Guzman said it’s not too late to register. The organization is counting on community donations for the medals (each one costs around $52). “There’s still time to get one for Lolo,” said de Guzman, who used the respectful Tagalog word for grandfather. Listen to the podcast for more on how the bipartisan legislation was passed, and also on de Guzman’s view of Trump’s bipartisan push on DACA.